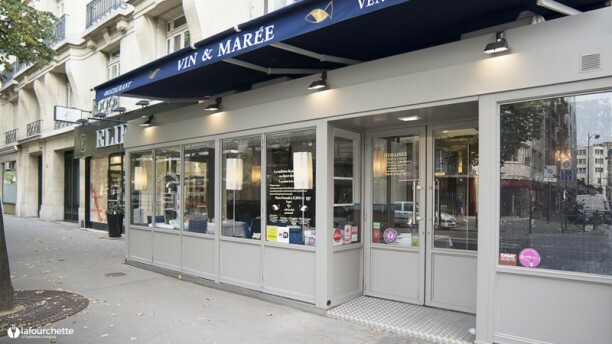 "Thanks to its buying capacity and knowledge of fishermen, Vin et Marée gets the best catch in the evening every day directly from the ports of Brittany or Normandy. This is why the slate varies each day depending on the catch of the day before, which guarantees that the products are fresh. The preparation is tasty and without a fuss, in order to highlight the finesse and authenticity of each fish. The wines are carefully chosen directly from the owners for a harmonious marriage with the fish." Fantastic seafood! Started with langoustines in butter sauce, then had scallop & shrimp pot pie and mussels in a lovely copper pot. Desserts was Grand Marnier Soufflé. Everything was amazing! Top quality for the price. Delicious! This restaurant is alwsays on my list when I am in Paris. The Dover Sole is to die for. The help is very courteous , great wine liste. Look forward to my next visit. Melanie W.
Very pleasant and welcoming, happy to take the 30% off the bill for using The Fork with no need for a reminder. A nice quiet room with well spaced tables, making conversation easy. A varied menu based largely on seafood, nicely presented and very well prepared. A delicious meal and a highly recommended restaurant. Le Saint-Pierre était excellent ! First 30 minutes we were waiting when we can make an order, because we'd need help, after 30 minutes our waiter said that we have losed a discount, because we had't made an order. The food was so-so, because starters and main courses was given for us all together. It was disgusting.